As planned we refought Guilford Courthouse today. John, Rob and Paul (Stevenson) made the trip up to my place. We used Black Powder, which all of us are very familiar with and enjoy as a good, playable ruleset. We played down the length of my 10' x 6' table. 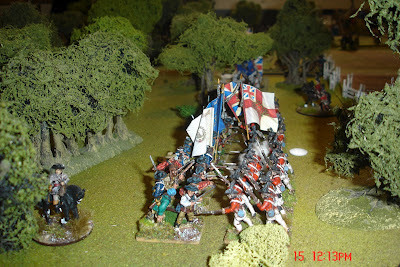 Paul and Rob were the rebels and John and I took the British. I got to be Cornwallis, and took Webster's brigade (23rd and 33rd foot plus the Guards light companies and a 6pdr) and O'Hara's brigade of a battalion of Guards and the Guards grenadiers. 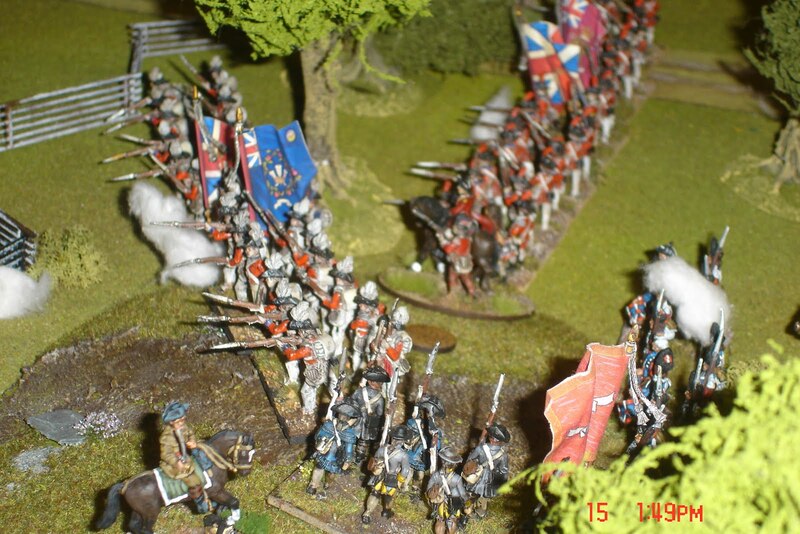 John had Fraser's brigade of the 71st foot, the other Guards battalion, the Hessian von Bose regiment and the Hessian Jager. 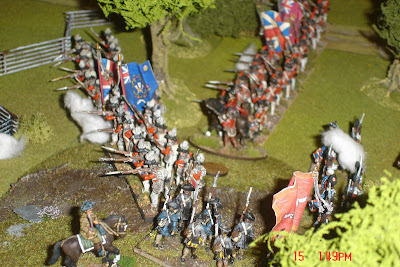 He also had Tarleton's British Legion cavalry and a 3pdr. I provided the tea but otherwise it was self-catering. The British figures are almost all Perry, with the exception of a very few Foundry and some of the British Legion are Old Glory. Rob and Paul took a brigade in each of the rebel lines. 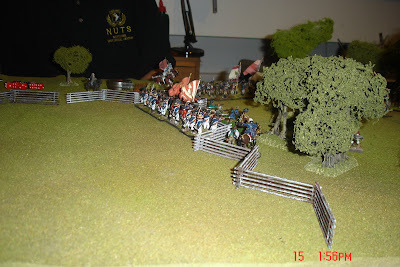 The first line were 2 brigades of pretty poor militia who I classed as wavering and unreliable and reduced their stamina by 1, supported by some rifle-armed skirmishers and two small units of cavalry. The cavalry were ok quality troops in the rules.The second line were 6 regiments of better militia in 2 brigades, but I still made them unreliable. (unreliable just means you can only activate them on a throw less than their commander's factor). The last line were all Continentals. 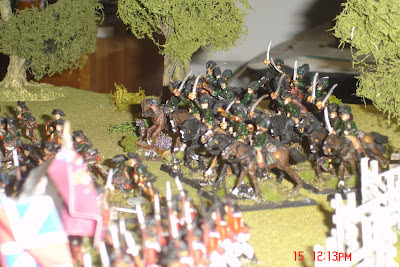 Two brigades totalling 6 battalions plus a gun. Only the Continentals had first fire. 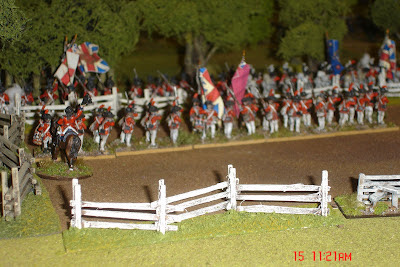 The rebel figures are a mixture of Perry, Foundry and some Old Glory 2nd generation. We agreed that we would ignore the normal rule where if half of an army's brigades are broken the game is over, otherwise if the British did get through the first two lines they would win automatically. 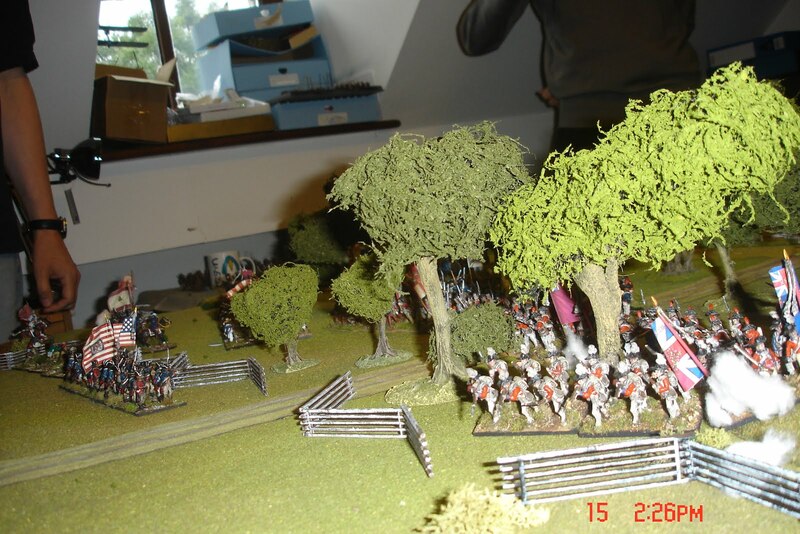 As stated in yesterday's post, all movement except within the fenced off areas was 6" a move (but you could move up to three moves as per the normal rules), and visibility was reduced to 12". This movement restriction applied to all units and commanders, who had to throw to see if and how far they moved, but not to skirmishers. Cavalry would be disordered on a throw of a 6 on a D6, per 6" moved. 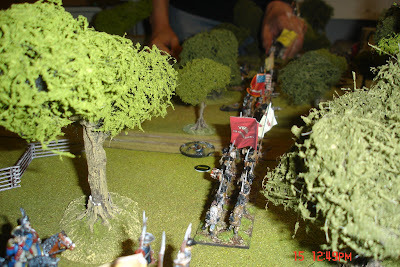 The wooded area also had an effect on saving rolls and shooting. 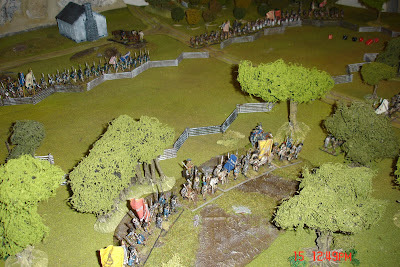 The rebels were free to reinforce their lines rather than just having them sit and wait. 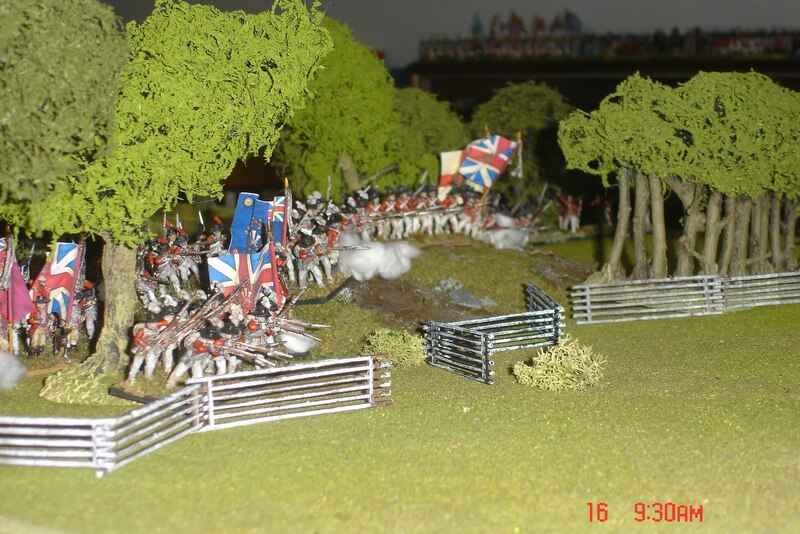 John and I agreed to take it steady and get stuck in with the bayonet where practical, as well as trying to rally off morale points as often as possible. Move one went well. Not. 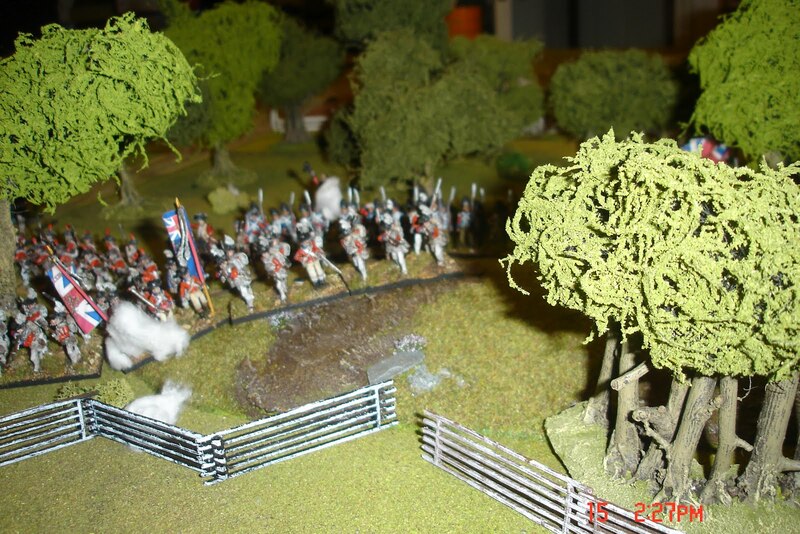 John failed his command roll but I managed to get up to the fenceline across from the first rebel line and opened fire with the 23rd and 33rd regiments, but without much effect. The rebel first line were not very good at all (i.e. they were pants) but they could still shoot. 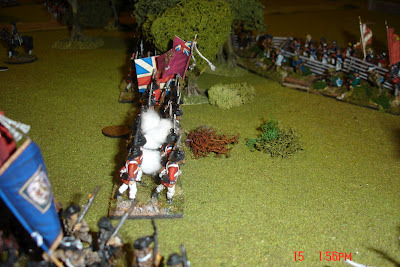 The British took some damage from their first volley but bayonet charges quickly saw a couple of rebel regiments off. Eventually, and after a very hard fight, the remains of the rebel first line was destroyed, but only after it had withdrawn into the woods to draw the British on and allow the second line to advance. 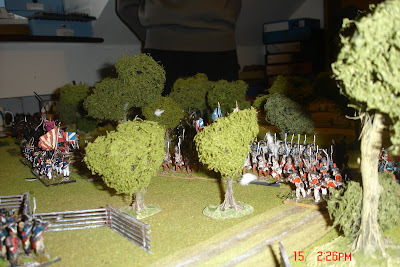 Their supporting artillery were shot down where they stood as they were unable to escape. The first line's attached cavalry and skirmishers were rendered useless as a striking force now that both brigades were broken, but they were still prove to be a nuisance taking pot shots at the British from the cover of the woods. 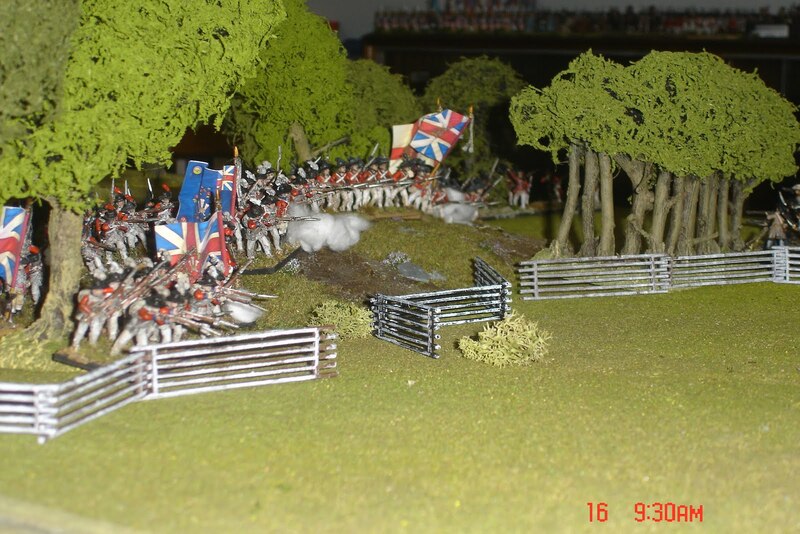 The British had no respite though as the second rebel line was a tougher nut to crack. A few of John's units (the Hessian von Bose regiment and the71st foot) had become shaken so he had to pause to rally them, and I was leap frogging my brigades to enable morale points to be diced for and removed. I was too absorbed in my part of the action against Rob to see what was happening on John's flank, but it looked very intense. John's Hessian jager were broken after they were charged and unable to evade. 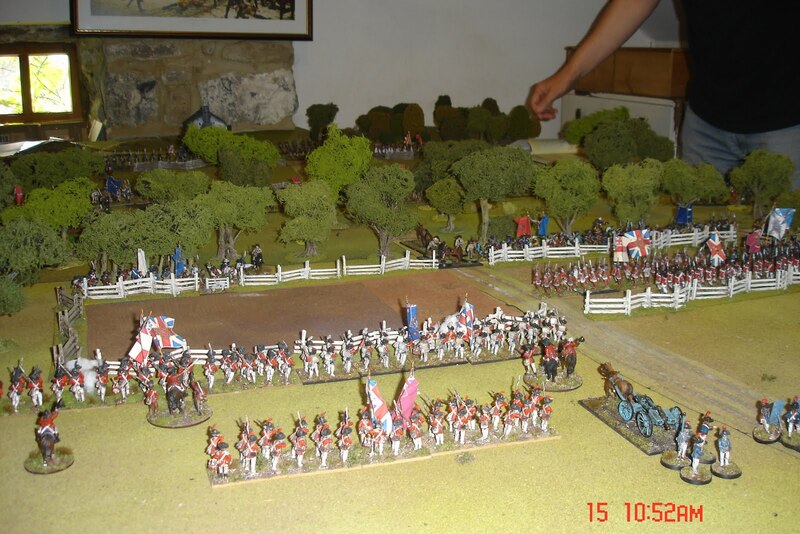 In turn, the British Legion cavalry charged at least once, I lost track, and broke a rebel regiment but were unable to exploit their win. 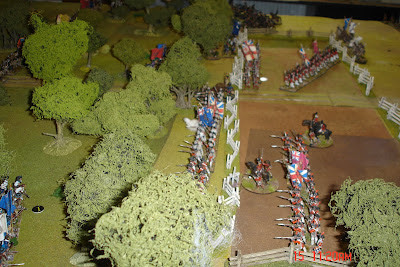 The fight over on John's flank broke down into a series of close range musketry duels and short sharp melees. 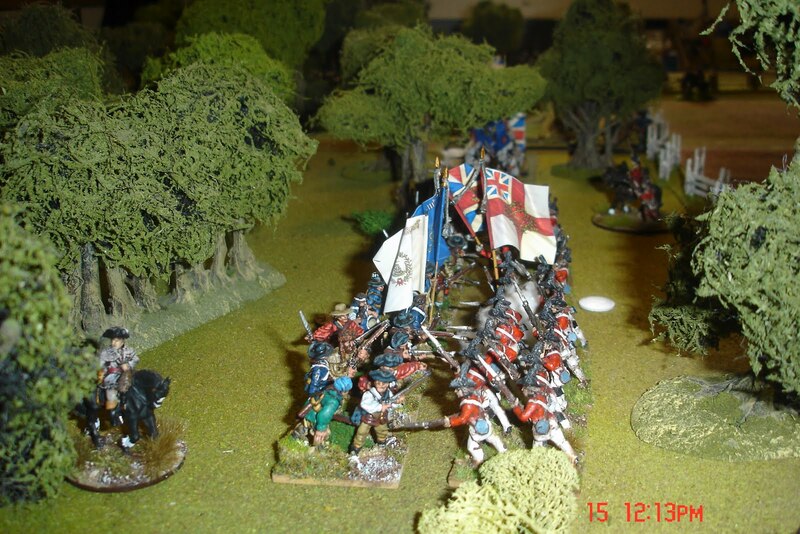 Paul's second line was finally broken, but by then his Continental brigade had advanced to the edge of the woods and was holding John's advance up. 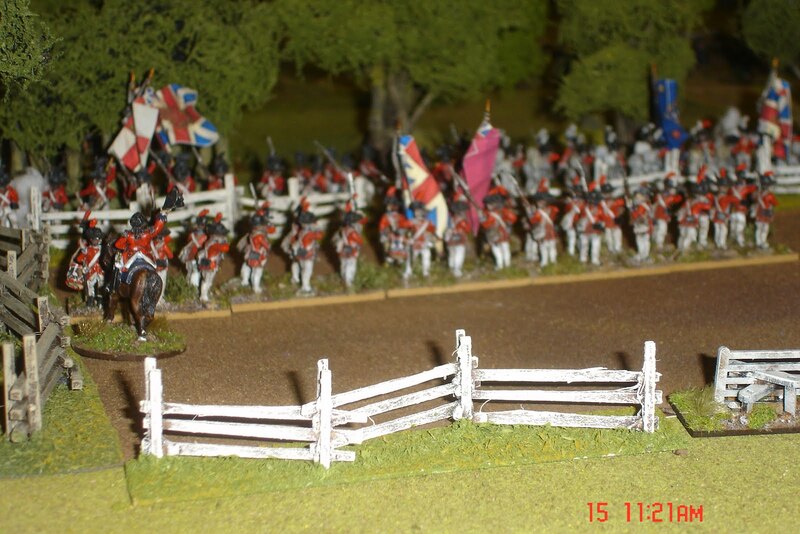 The Continentals poured musketry into John's Guards battalion, which was shaken and eventually broke. Meanwhile my brigades had got well into the woods and were engaging Rob's second line. A couple more bayonet charges successfully shattered Rob's brigade but not before my combined grenadiers had been charged in the flank. Had they not been 'steady' and 'crack' they would have broken, and in the next turn their opponents were themselves charged. After a couple of furious rounds of melee the rebels broke. A turn of so later we decided to call it a day as we'd been playing for longer than the real battle lasted (about four and a half hours including lunch and tea breaks). 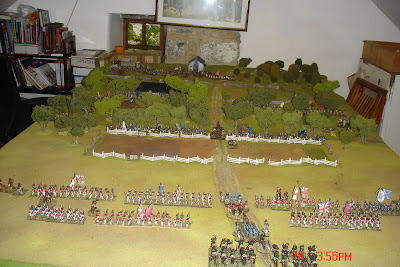 The first two rebel lines had been shattered, and the British were still in a strong position (on my flank at least) but the thought of facing the third line of largely unscathed Continentals was not a pleasant one. I think the British would have been able to take on the third line once they'd rallied off as many morale points as possible, but it would have been touch and go facing six almost fresh Continental regiments. The game was a huge success and very enjoyable if rather knackering, peppered with the usual amazingly bad command rolls and some tremendous saving throws, usually at critical moments in the game. 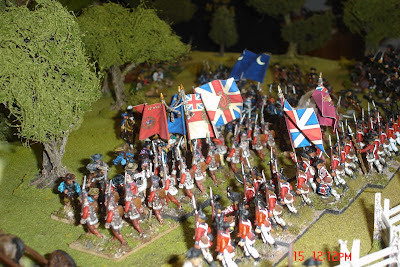 The British were happy to have got what might have been classed as a winning draw out of it (although had we been playing the victory condition rules to the letter, the rebel army would have collapsed once their second line was broken. 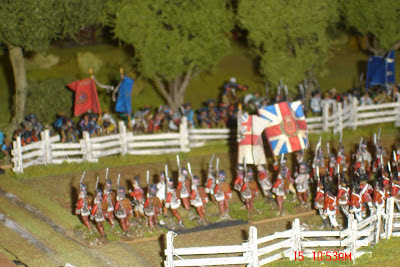 Either way, it was assumed that the rebels would retire under the cover of darkness leaving the British in possession of the battlefield. The photos (which could have been better but at least give an impression of the confusion fighting through the woods) show the British progress attacking the rebel lines and fighting through the wooded area. I just about had enough trees! 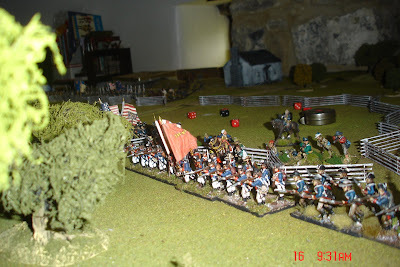 Oh, and I know the Guards didn't carry flags in the war but they look good. 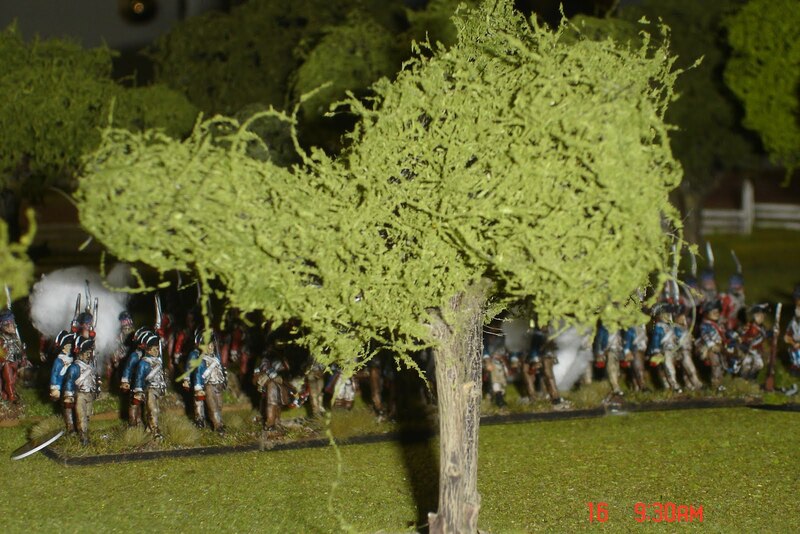 The early pictures give a pretty clear indication of the course of events, but once into the woods (orchards?) things do get a bit more confusing. As you would expect, of course, one's horizons becoming narrower. Overall, a good feel for the game. 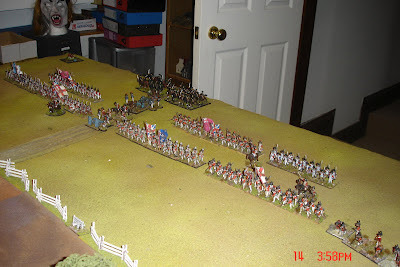 Just finely painted and arranged armies, too! Great report and photos Colin.